Mums are the main flowers in this charming garden in my hometown. When I think of autumn, I think of hot apple cider, fall leaves, sweaters - ok, the list of things I still need to get done before it gets cold - and mums. Chrysanthemums, one of the longest lasting cut flowers there are have become a fall garden staple where I live. Chrysanthemums are also the foundation for most of the "safe" bug sprays on the market. Pyrethrum, derived from the Pyrethrum daisy, is not so much safe as it is less harmful than other bug sprays on the market. It should be used only as a last resort and kept away from fish and water sources. So it was with mixed emotions that I accepted several mum plants. I want pollinators coming to my garden, not getting discouraged from visiting. A quick check and it was good, mums repel roaches, ants, Japanese beetles, ticks, silverfish, lice, fleas, bedbugs and spider mites. Nothing about butterflies and bees. Shortly afterwards, I was driving around town and saw this charming garden - can you count how many mums it has? A variety of chrysanthemum colors stand out against the grey of the tree trunk. Impatiens are in the back, adding color but the front of this garden is definitely mum-dominant. 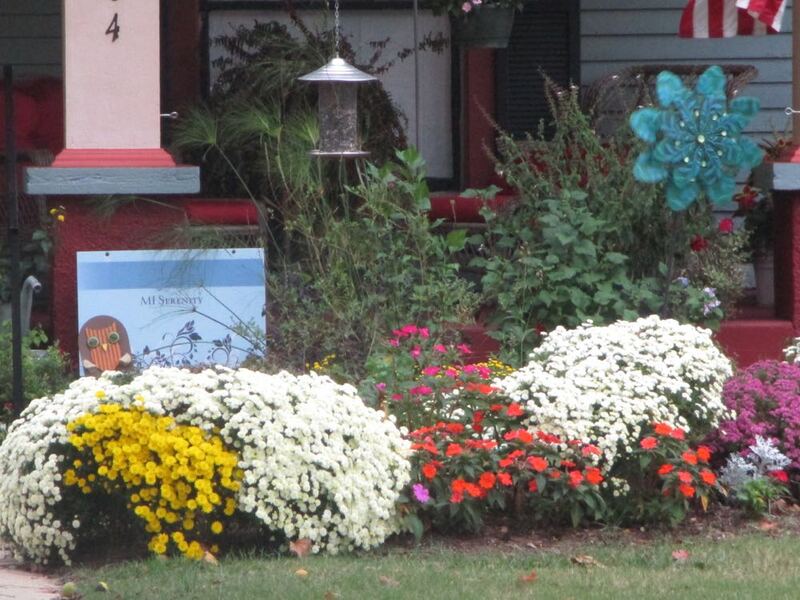 On the right side, a nice combination of mums and impatiens, both adding more color to this front porch. Love the size of these white chrysanthemums, they remind me of a snowdrift! When I got home, I walked through my garden to see what mums were blooming. I have several starts that are small and two mums taking over a garden corner where ground cover roses were blooming earlier. One little rose was still peeking through, a last nod to summer. See the little pink rose in between the two mums? My mums will never grow as big as those in that charming garden because they have real soil to grown in. My mums are tucked into rock crevices and soil pockets on my hillside but I still enjoy the pop of color they give my fall garden, even if its only a small pop.